In October 2018, Paris Aéroport welcomed 9.4 million passengers, an increase of 6.0% compared with October 2017. 6.4 million passengers travelled through Paris-Charles de Gaulle (+5.7%) and 3.0 million through Paris-Orly (+6.7%). The number of connecting passengers decreased by 3.5%. The connecting rate stood at 20.6%, down by 2.0 points compared with October 2017. Since the beginning of the year, Paris Aéroport passenger traffic has increased by 3.7%, with a total of 89.4 million passengers. The number of connecting passengers has decreased by 3.4%. The connecting rate stands at 21.2%, down by 1.5 points. Passenger traffic at TAV Airports, 46.1%-owned by Groupe ADP, increased by 37.8% in October 2018 and by 35.9% since the beginning of the year, including, from May 2018, traffic of Antalya airport, in which TAV Airports took a stake. Passenger traffic at Santiago de Chile Airport, 45%-owned by Groupe ADP, increased by 5.6% in October 2018 and by 8.5% since the beginning of the year. Passenger traffic at Amman Airport, 51%-owned by Groupe ADP, increased by 9.2% in October 2018 and by 5.8% since the beginning of the year. 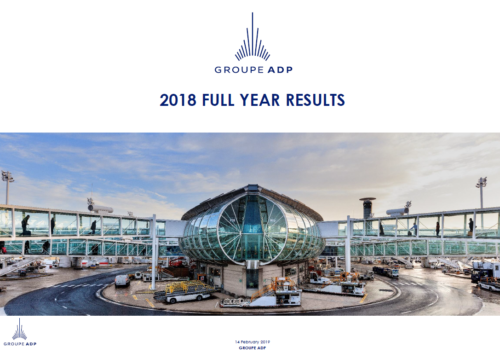 (1) Groupe ADP and TAV Airports have, a shareholding of 21% and 15%, respectively, in Zagreb Airport. To be compliant with TAV Airports presentations, Zagreb Airport traffic figures are integrated into the TAV Airports group traffic figures. (2) TAV Airports has taken a stake in Antalya Airport since May 2018. To be compliant with TAV Airports' presentations, the % change presented above takes into account Antalya traffic just from May 2018. (3) Restated figures taking into account Antalya's traffic on a like-for-like basis for 2017. (1) TAV Airports has taken a stake in Antalya Airport since May 2018. To be compliant with TAV Airports' presentations, the % change presented above takes into account Antalya traffic just from May 2018. (2) Restated figures taking into account Antalya's traffic on a like-for-like basis for 2017. The Board of Directors of Aéroports de Paris decided in 2015 to implement a policy for the payment in cash of an interim dividend up until the financial year ending on 31 December 2020. For the 2018 financial year, this interim dividend amounts to €69.28 million, i.e. €0.70 per share. The ex-interim dividend date will be 6 December 2018 and the interim dividend for 2018 will be paid out on 10 December 2018.